Are there any open orders for the 788, or is it an irrelevant aircraft now? Through September there are 86 788s left to be delivered. So that's 58 actually likely to be delivered. 22 are for AA, and the remaining 36 are scattered between a whole bunch of operators but all look reasonably solid. There might be further top-ups from some of the smaller operators who benefit from the -8's lower trip cost. Does the 787-9 have greater range than the A350-900? It's on the chart but it's seems to be out of the running because it is stuck in the 'too small' category. I guess it's doomed. The 779 didn't even make the chart. No, it was United, one of the biggest Boeing operators and both 787-10 and A350 customers. And I think, in the end, Boeing will develop a slightly bigger wing for the 787-10, possibly -11. Unless the heavy weight 777-8 becomes a hit after all. Just because of what United indicates; 8000NM / 300-350 seats is a kind of centre of the market, a space that Boeing used to dominate with the 777-200ER/300ER. You'll need a new center wing box, designed to accommodate bigger/heavier gear, to get that done. And once you've made everything heavier, the engines more powerful, and the wings bigger, don't you basically have an A350-900? I was under the impression that Airbus provided that chart to United, but not sure where I heard that. Regardless, the 787 has outsold the A350 for four years in a row, so there certainly is a market for the plane. It looks like the bulk of the market is for airplanes smaller than the 787-10 based on orders. With that said, I fully expect more 787-9, A350-900 and 787-10 orders. They are optimized for different missions. A 787-10ER, a composites 777-200ER, a 777-8 Light, narrow A350. Observation is that the 777ER / A340 replacement market shows no indication of adoption a 787-10 / 777-8/9 combo as preferred replacement. That was the case when the topic was posted & it hasn't gone away. E.g. Qantas, Korean, BA need to order soon. I agree with smi that Qantas could well order a small subfleet of 6-8 787-10s for Asian and peak transtasman routes. The chances for the -10 would be higher, in my opinion, if Boeing wins Project Sunrise. 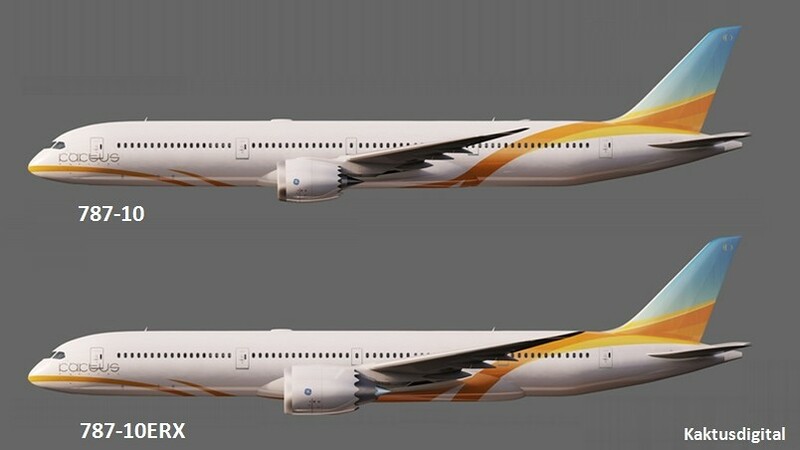 Adding on the 777-8 and then a possible A350-900 for the gap between the 777-8 and the 787-9 would involve two new jet types at once whereas adding the 787-10 means only one new type. If Airbus wins Project Sunrise, then the reverse could happen to benefit the A350-900 and it would be a real contest to see which OEM would win any possible order for the gap between the 787-9 and the A350-1000. Flame away, but I still wouldn't be surprised to see DL order some 789+78X in the future if the price and availability became right. Replace newer 767s and the 77Es. Yes I'm well aware they'll have A339 and A359. 5000Nm is to / from Asia. Where the growth is. Everything that has come out of Boeing indicates that the limit on the 787-10's MTOW (and that of the 787-9, for that matter) is the landing gear, not the wing. Not disputing that at higher weights the wing might be too small for optimum efficiency at long range, but it's the landing gear that imposes the hard limit. The 787-10 is a 6000 nm plane with full pax and bags. That is plenty enough range for 95% of the long haul flights out there. Now if you need to fly an additional 1000 nm sure use a bigger, heavier, and less fuel efficient plane. I agree with you. They need a further 20-25 aircraft in that general size range for replacement. But not immediately. I think there will be another contest between 787 and A350 in the early 2020s. The result may be partly dependent on what sort of capability the later A350s in the original order end up bringing to the table. If they are full-boat 280 t birds (unlike any of the first batch) then they can do things like replace the 77L on ATL-JNB. If the later A350 deliveries are gimped like the first batch, that may give the A350 an advantage for future orders; the 789 is smaller and the 78J obviously doesn't have the payload range for 77L missions. Are there any airlines with sizable older A330-300 and B777-200ERS apart from BA and AA that haven’t ordered replacements yet ? I think we can forget about Alitalia! 6000nm is a bit of an exaggeration when you factor in real world considerations, the A330 for example has a very similar range its longest route at present is just under 5200nm (SZX-LHR). Add cargo and that number drops, and realistically most airlines flying that far will fly cargo. More to the point though is that while it may be possible to fly the 78X on a route, that doesn't mean it is the most economic choice for the route. The A359 and 789 offer more flexibility and capability while still being good on the shorter routes, and additionally the 78X doesn't seem to have the much-reduced cost to manufacture. 95% of long haul flying is too optimistic a figure IMO. Most airlines don’t even utilize max range of most of the aircraft that they order so why is the -10’s lack of range an issue all of a sudden? 95% of the long haul flights out there is not full pax & bags only. 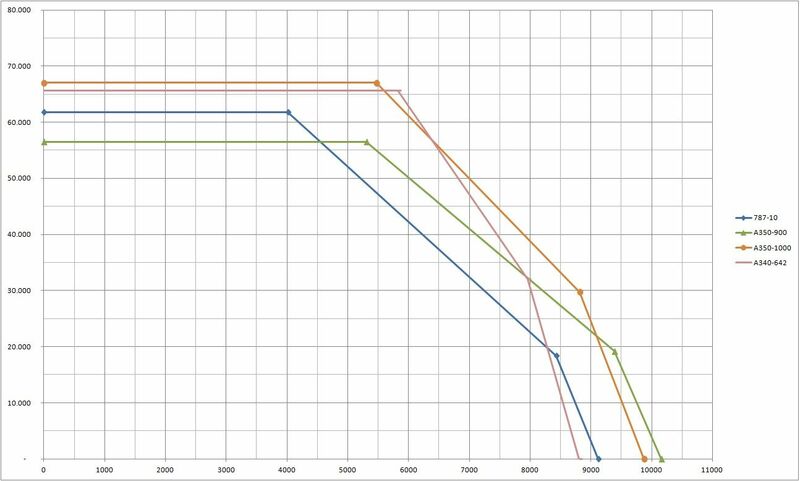 This chart is fine as long as the sweet range spot is correct for your airline.Clearly it is for UA.But equally this was not the case for BA (at least at present).They have plumped for the dash 10 so one must assume they did not need the additional range (read weight/drag/coo/Sfc) that the 359 offered. Their 7810 order surprised me at the time,but perhaps it just shows how $$ sensitive modern aircaft operations are to range. FRA-LAX doesn't seem like a good idea, specailly east bound. And cargo FRA-LAX is really significant apparently, looking at the frequencies cargo options e.g Lufthansa offers. (From MUC also). But FRA - US East coast should be fine. A 4 hauler like the A340-600 might be more usefull FRA-LAX, lifting up to 15t more revenue cargo payload, with the same passenger payload. (With less, wider middle seats, a quiet cabin and no ETOPS restrictions ). And also about 30% more costly to operate. Any route we see a 242t A330-300 or 233t A330-200 operating should be viable for the 787-10. Because it's a.net, and some people just have a need to be that way. Look at the routes flown by the carriers you consider prospects for 787-10s. Delta, for example, has 21 764 from 2000-2002, and 11 332s from 2004-2006. Every route flown by those aircraft can be flown by a 787-10. Carrier routes maps and planespotters.net's aircraft databases are your friends. I think we can, too, but a 787 will look magnificent in AZ new livery. I'm thinking that if they get 78X, they may as well get 789 to go with it... there's definitely a niche it can fill that the A339s couldn't; and DL historically isn't afraid to op a similar-capacity-different-capability fleet by any means. That was specifically in regards to 744/A343 replacement. That doesn’t mean LH would never be interested in a 787-10 or any other plane with similar range (after all, they have no issues flying 18 A333s). With Etihad and United having both received their 1st B787-10 I wanted to re-examine future sales? 1. What’s the hold up on Emirates firming their order for 40? 2. Have the leasing companies managed to place more apart from with KLM and EVA? 3. American Airlines replacing 777-200’s? So UA - which has them on order - doesn’t seem them as an ideal 77E replacement, and LH has said that they aren’t the best fit for them. Any thoughts on the OP queries? From where Emirates sits geographically I can see how the 787X could be very useful/economical particularly to secondary cities in Europe (they already do all the primary cities).Would also work well into parts of Africa-And Asia. With BA (don't think they have announced anything) one assumes it's for London to East cost N America destinations -only? Would be highly economical on such flights.The distances are short enough (just) to carry a full load of cargo too.There may be others such as Moscow? Thing can always change, 787-10 at LH as a A330/A340 replacement is not out of the question. I believe they are having talks about that as we speak with recent news. When looking at what the 789 is doing, 6000 nm is a conservative figure. In fact, Boeing first listed the 787-10 at 7000 nm, so 6430 nm is in fact conservative. *Both have extremely similar capacity, just different range and availability. 10-abreast B777-300ER and their 7400nm range. A330-300 and B777-300ER sales are slowing down fast, while A350-900 and B787-9 are selling like hot cakes. So B787-10 comes to play in between this market. While it have the nice capacity of A350-900 which airlines love, and the commonality with B787-9, the lack of range makes it less flexible. While the fuel efficiency is amazing, it still can't do heavy duty routes like A350-900 did. And while the 6400 nm range is nice like A330-300, the large capacity of B787-10 is too much on some routes, after all Frequency does matter to Premium Passengers. So lack of flexibility in range and capacity is the main problems for B787-10. I don't see this plane going further than B787-8. Of course the A359 will be better for some airlines. As I stated before, the 787-10 needs a CMC engine PIP to have the range to compete. While not winning LH is a big deal, something would be wrong if the A359 wasn't optimal for some airlines. The issue with the A359 is a lack of 2019 to 2022 production slots to win new orders. That is not an issue with the 787-10 thanks to the production ramp. If airlines wait for perfection, another airline will beat them to the market. I wouldn't want to compete an A340 vs. a PIP'd 787-10 in say 2024. Another 200 units in the next 4 years wouldnt be a bad result? UA sees them as a partial B77E replacement, for the LATAM and TATL routes that are currently 77E operated. The plan is to replace the 77E with a combination of B787-10 and A359. Only if you can work it without payload reduction. that advantage has vanished. Think about why LH is profitable with their alleged fuel guzzlers. Partly because all their aged A340's are fully paid for assets now that cannot depreciate further. The issue with the A359 is a lack of 2019 to 2022 production slots to win new orders. Even after AA cancelling its A350 order and the upcoming EY cancellation? I guess that would open up a few slots in that period. I could see AC ordering them for high volume TATL routes, but that will have to come once they feel comfortable with another period of significant growty, seeing as they have basicially just completed their widebody renewal project. The A333s have another decade left, and that fleet will likely continue to grow gradually short term. AC let their 787 options expire. Has China Southern shown any interest? They have not expired. AC opted not to exercise them—for now. You would only take that sort of payload reduction on certain LH routes, and that's why LH has A350s. From Germany, the 787-10 could carry MZFW to all of the US, the Middle East, and any place they are likely to fly in Africa. They could carry full passenger payload plus some cargo to India and most of Centrral/South America. The only places where range is really a problem are East/Southeast Asia, South Africa, and deep South America. LH just told us that they want to speed up A340 replacement, and are evaluating both the A350 and 787 to do so. The results will tell us something about whether flexibility or the lowest possible CASM brings more financial benefit (although they will also tell us something about current pricing by the two OEMs). The more we look at the 787-10, the less it looks like an "A333" as we historically see that, a ten hour jet. And the more it looks like a surgical twelve hour jet that can do certain jobs (like Germany-LAX and SFO?) at unbeatable unit cost. The synergy with 789 means the 787-10 could become the backbone of more fleets than we realize, and use the 789 as an accessory where performance or weaker traffic demand. On the question of 787-10 range: Is it 5000 or 6000 miles? Didn't Boeing change the way that they determine range to make it more realistic than it was in the past? If so, is 6000 miles that unrealistic? I really do not understand people claiming its a 10 hour jet from sea level. From Nairobi or Jobergs altitude, maybe. Here is what we know, 789 is officially 7,635nm, but seems to be able to do 7,600 statute miles strongly. It is deployed in scheduled service out to 9,000 statute miles on PER-LHR. The 787-10 is officially 6,430nm. So my low quality estimate is 6,500 statute will be no problem for the 787-10 to do scheduled services. This opens up all of Lower48-Europe, and some West Coast to Asia. I think it might do SEA-HKG but probably not LAX-HKG. LAX-NE Asia appears to be in range. Those are big markets. Depends on what you want it to do. The latest payload-range chart shows that you can carry maximum payload almost exactly 4000 nm (4600 statute miles). But not many airlines will be carrying that payload. It would require the enormous hold to be totally full of pretty dense cargo. At more realistic passenger and cargo loads, you can expect to fly around 5800 to 6000 statute miles. If you don't want to carry any cargo, Boeing's specified range for pax and bags in a typical configuration is 6430 nm (7400 statute miles). The latter number is calculated using Boeing's new methodology, which assumes 9-abreast economy and somewhat heavier cabin furnishings than the previous methodology. Of course these are all still air ranges and you have to take real-world flight paths and winds into account. What this means in the real world is that the 787-10 will do fine for most airlines on missions up to around 12 hours, unless the route is one where the hold is full of fruit or live lobster or something else extremely heavy.